Death corresponds to the Hebrew letter Nun, which means fish. Fish (Nun) swim in the water (Mem), and so one of the things the Hanged Man comes to terms with and learns about is Death. The fish is also the symbol of resurrection and of Christ himself. Taking this metaphor further, this letter then also represents the state of the world once it has been fixed by Christ; it represents the way things should be – and Death is a part of existence just as much as life is. This letter also represents the wisdom that comes from accepting the knowledge gained from swimming in its sea, and a lack of self-consciousness. As fish live under the water, this letter represents the hidden life in unexpected places; beneath the surface. 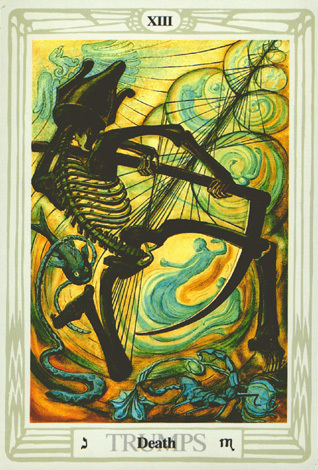 Astrologically, Death corresponds to the Sun Sign of Scorpio, which itself symbolizes the cycle of life and death; a very fitting symbol, for the card Death does not just symbolize Death, but also implies by its existence the existence also of life. Scorpio is the Sign of transformation and change, and so too is Death the card of transformation and change. Death rarely, if ever, signifies physical death, and instead usually means metaphorical deaths. This card also reminds us to not look at death as purely an ending, but also a beginning; for rarely do endings not have a new beginning that follows them. The Fool, however, emphasizes beginnings, while Death emphasizes endings – though both phases are implied by both cards. Death is a force in all of our lives, and so like Fortune, this card represents powerful, inexorable forces in our life. These forces change us greatly, and also transform us – and transformation is the key to this card. Death is not just the ending of life – it is the beginning of what comes after life. Death represents endings, yes, but also rebirth, and moments of transition. Transition and transformation are the key aspects of this card. On the Tree of Life, Death lies between the Sefirot of Tiphareth (Conscious Harmony) and Netzach (Bliss and Degenerate Weakness). This position places Death as being the destroyer of perfection (he already has destroyed the Hanged Man’s perfection, as he is twelve – the number of signs in the Zodiac), taking the balance of Tiphareth and weakening it. It is the force of Death that prevents Tiphareth’s balance from becoming stagnant, and it is through Death – and the fear of it – that sin arises. Death represents the movement stirred on by powerful forces, and the imperfection that is a part of existence. The inexorability of Death is seen in the Rider-Waite art, as he rides his horse steadily forward, ignoring the pleas made by those around him, killing them anyway. He is a menacing figure, towering over those before him. In the distance, the sun rises, hinting at a new birth. In the Thoth art, Death appears to be locked in a dance, surrounded by lost souls. A scorpion appears by him, symbolizing transformation (through Scorpio), and also a fish, symbolizing rebirth and resurrection. An eagle also flies above his head, signifying the last part of the cycle of life and death (rebirth, change, and realization – this is my own personal take on it) – the realization of one’s new life. In a reading, this card never (or at least, almost never) means actual, physical death. Rather, it asks you to examine transition or transformative stages in your life, and eras that might be ending. It asks you consider giving yourself a chance to be reborn, to examine imperfections in your life, and warns you of powerful forces out of your control headed your way. Reversed, this card’s energies are hidden or twisted somehow; perhaps one’s transformation is only on the surface, or the forces coming for you can be controlled. This entry was posted on June 23, 2011 by Z. M. Wilmot. It was filed under Tarot .